Repair USB cables: is it Possible and Advisable? 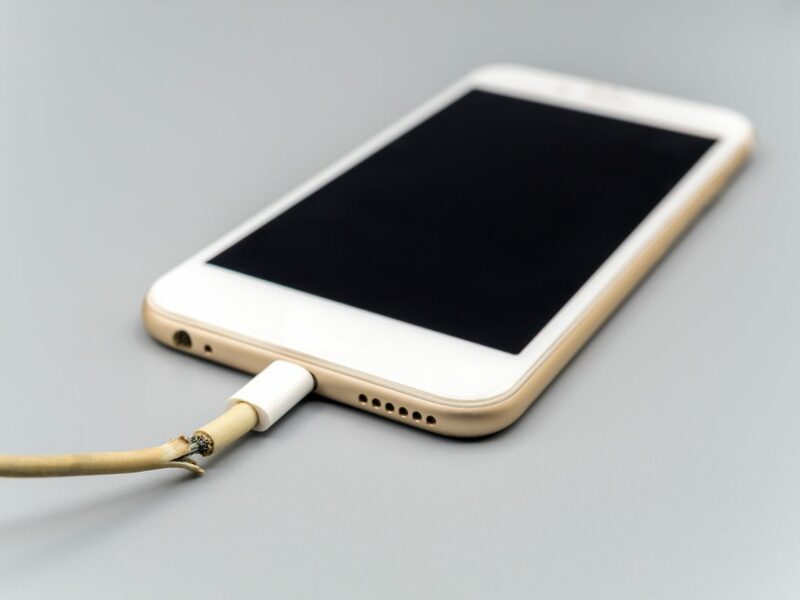 If you have ever broken the charger cable of your smartphone or some other device you may have tried to fix it with a little bit of zeal but, is it the best way to repair a USB cable? And what’s more, is it advisable to fix it like that? Although it is hanging by a thread we tend to try to repair the USB cable of the charger with zeal, superglue or anything else that we have on hand. If this does not work it is not surprising that we turn to the great know-it-all Google to find out how to fix the cable of our smartphone. You may find yourself with a few solutions, but the most sophisticated ones are not free. The question is, is it worth buying products to try to fix the USB cable instead of buying a new one? Not really. To begin with, you can find chargers for good smartphones at an affordable price online and you’ll probably end up costing the same as fixing it. Also, sooner or later it will break completely and you will have to replace it. However, if it is a more expensive charger – like the computer – if it is worth trying to repair it if what is damaged is the external coverage. If we are talking about the cables themselves better do not bother. Of course, beware of broken cables, try not to leave them unattended. Although it is very unlikely, if a short circuit occurs it could create a fire and it is not a watering that you want to take. First of all, start to take better care of your chargers to avoid breaking the USB cable at first. It is a normal consequence of use but there are some measures we can take to take better care of them. To begin, try not to bend them abruptly, as the coverage will end up breaking. So, try not to use your phone while it is charging, as you will turn the cable weakening it. However, if you really want to extend the life of your charger the best thing you can do is invest some more money in it, in the end, the cheap is expensive. If you have any queries on this topic, let us know them in the below comment box and we will get back to you to solve all your questions as soon as possible. Also, share your thoughts on the same in the below comments section. Do you always get an ‘iPhone storage full’ message? Are you running out of iPhone memory or is the storage space of your iPad full? Apps and games are getting bigger and bigger, making it time to free up space. With these 7 tips, you can get some scope again. You do not need some apps every day. Consider, for example, the app of your newspaper, which you could also use via the mobile website. There are also apps that give common problems, such as the Facebook app: it slurps unnoticed your iPhone battery empty and collects data about your use. Often mobile websites are just as good: Facebook can be used perfectly via the mobile browser, without having to install an app. Also, YouTube can be used via the browser. Especially useful if you rarely use it. The use of mobile websites does mean that Safari saves data, such as cookies. It is, therefore, best to regularly clear the Safari cache. You probably do not use all the apps on your iPhone. There are always a few apps or games that you will never look back to. Try to use as much as possible the standard apps that Apple provides, install a few apps that you really need and save the rest. Of weather apps and navigation apps you really only need one good. Use our app lists to find the best apps in a certain category. Since iOS 11 you can have apps automatically removed if you do not use them for a certain amount of time. The data is simply saved, but the app is automatically removed from your device. You can download the app from the App Store at a later time and then have all data immediately back. Tap General> iPhone storage . Turn on the switch in Room apps. With this trick, you can free up a lot of space in one go. Note that it is not an official function of Apple, so it will not work in future iOS versions. Keep that in mind if these steps no longer work. Go to the iTunes Store and tap Movies. Choose a random movie that is larger than the free memory on your iPhone. If you have only 400MB left, the film must be larger than 400MB. Tap on Buy or Rent, then you get a message that the film is too big to download. Be careful not to buy the movie by accident, so do not let your finger rest on the Touch ID sensor and do not press the iPhone X side button twice. If you go to Settings> General> iPhone storage, you will see that memory has been released. By repeating the trick several times you can free up more iPhone storage space. With many people, the iMessage Messaging app takes up a lot of iPhone storage space, especially if you regularly exchange photos and videos with people. Go to Settings> General> iPhone storage> Messages to see how much space the Messaging app (iMessage) takes. In some cases, it is only a few hundred MBs, but there are also people who have many gigabytes in the Messaging app. Scroll through the messages and throw away large photos and videos. Enable the option to automatically remove iMessage messages so that you do not have to worry about them anymore. The same applies to WhatsApp: you can also have a lot of pictures and videos stored there unnoticed. We have a separate tip about clearing WhatsApp and reducing data usage, for example by not taking all photos in a backup. There are many more apps that store a lot of data. At Settings> General> iPhone storage you can see how much storage space certain apps use. Some apps are not that big themselves, but they download a lot of data (such as Spotify or the Podcasts app) or contain a lot of material that you have put in yourself (such as the Music app). Other apps that can unnoticeably take up a lot of iPhone storage are Garageband, iBooks, RSS apps like Reeder and navigation apps. Often you do not have to completely erase an app. Clearing the cache may be enough to free up more iPhone storage. This is temporary information that is stored offline, but that you do not need immediately. It makes apps respond faster, but they also take up a lot of iPhone memory. You can solve this by clearing the app cache. Photos and videos will probably take up a few gigabytes (!) Of storage space on your iPhone or iPad. You can view this via Settings> General> iPhone storage> Photos. It takes a while before you have the numbers in the picture. If you tap the item Photos you can also immediately clear the folder ‘Deleted photos’, which saves a few gigabytes. These are photos that you have thrown in the trash for the last 30 days. These photos will be permanently erased after a month, but you can also accelerate this slightly. All your photos and videos are also saved as backups on iCloud. If you use the free 5GB iCloud storage you will also quickly reach the limits. You could choose to save all photos to an external service, for example, Google Photos. With Google, you get unlimited storage, with Flickr 1 terabyte and with Microsoft OneDrive 5GB. You might get extra storage space from Microsoft because you use Office 365. Furthermore, you could make a backup of the photos. Determine which photos you want to keep and discard the rest. That makes a difference when making backups. The simplest way to backup all photos is to connect to the Mac or PC and then import all photos to a folder or external hard disk. However, you only have one local backup on a physical disk. That can be risky because as soon as the computer is stolen or the hard disk breaks you are all chalk. It is safer to also keep a backup with a cloud service, such as Flickr, OneDrive, Google Drive, Dropbox or one of the many other online storage services. Comparison between different iCloud Storage services: Which is better? Have you made a mess of it in recent years and do not know where to start cleaning up? If you want to free up a lot of iPhone storage space once, you can restore the iPhone and redecorate it. For that, you go back to the iPhone factory settings, after which you start again with a clean installation. But you can save many gigabytes in one go. Most people use only a dozen or so apps really intensively; in such a situation it is fairly easy to start with a clean iPhone. 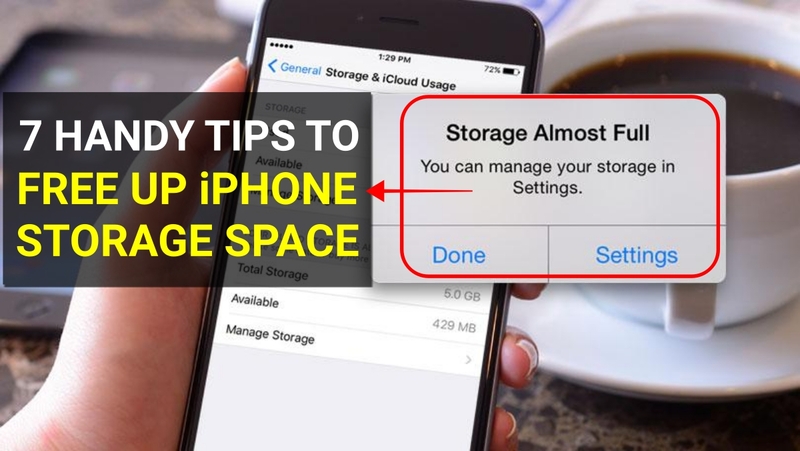 These are the 7 handy tips to free up your iPhone or iPad storage space when it is full. I hope this article will help you to free up space on your device. If you have any queries regarding the above tips, let us know in the below comment section. We will get back to you to solve all your queries as soon as possible. Do you know any other tips to free up iPhone storage space when its memory is full? Then write them in the comment box below. WhatsApp for iOS, like many other services, compress the images before sending them to another user. The means that an image that you are going to send to an acquaintance, it will look worse when it arrives with a lower quality since WhatsApp automatically compresses it to save data and shipping costs. Generally, this is not a problem when we send photos that are going to be consumed on the same mobile, but if we want to send a photo to work with it on the computer later or any other function … losing quality is not a good idea. Then what to do now? Do not worry much because we have a solution for this problem. To avoid that an image loses quality when sending it through WhatsApp is relatively simple, we just have to not send it as an image. That is, send the photo as a file so that WhatsApp does not apply its compression. Another option, of course, is to use another transfer system that is not WhatsApp. If you want to send it in only WhatsApp then this solution is for you. Follow the below steps to send photos through WhatsApp app without compressing the quality of the images. In Photos, choose the image you want to send without loss of quality and then press Share> Save in Files. Save it to the folder you want in Files. See the below image for the above steps that are performed on iPhone. Open WhatsApp and go to the conversation where you want to share the image without loss of quality. Press the + icon in the lower left and select Document. Find the image that you previously saved in Files, select it and confirm to send the photo. That is it! With this, the other person will receive the image without loss of quality and without any compression. A direct preview of the image in the conversation will not appear, but it will appear as a sent document. Opening the document we will visualize the image and will be able to keep it in Photos. Keep in mind that this also means a significant increase in the storage of WhatsApp backup, so it should be done only with the really important images. If you want this to not happen, delete the image of your conversation after sending it. What other options are there? If you need WhatsApp to send it, faster there is no way to save the image in Files and then send it as a document. Another option is if you are close to the other person and have an iPhone then sending through AirDrop will work, which is the most direct and effective method. That is it!. This is how we will be able to send the photos in WhatsApp without compressing its quality. I hope this article will help you to share the images with your friends with the original quality of the photo. If you have any queries regarding the above method, let us know them in the below comment section and we will get back to you as soon as possible to solve all your questions. Do you know any other methods to send photos without compression? Then write them to us through our contact us page. Checking the health of an iPhone battery has become a major issue in recent months. From being a mere curiosity to becoming a necessity, to see the state of the battery of an iPhone or an iPad is quite simple. You can also know the health of your iPhone or iPad battery on your iPhone, Mac and Windows devices. These are the best ways to do it. We have to know few things before getting into the methods. Let us see what we should know about our battery. Batteries have a life cycle by their very nature and current technology. Manufacturers ensure a certain capacity threshold as the battery is used. This is known as charge cycles, which measures the number of times a battery is completely discharged (it can be at once or in several “sessions”). For the iPhone, Apple estimates that after 500 charging cycles the battery should be able to maintain 80% of its original capacity. If you are below this 80% after 500 cycles and still under warranty, you can request a free repair. If not, you can request a replacement whether you are exhausted or not, regardless of your warranty, for 29 dollars during all 2018. Each iPhone consumes its battery and deteriorates its health in a different way, depending in large part on our uses and customs. It is important to make one thing clear: not all iPhones wear out their battery at the same rate. Some Twitter users have confirmed that their terminals had about 800 or 900 cycles and still retained more than 80% load. It will depend on your use and demand with the iPhone. Finding an app that measures the health of the battery of the iPhone is not as simple as it seems. There are many apps that promise to better manage the battery, but few incorporate their status. And those that do, it’s not a complete information. Battery Life is one that will show us a fundamental function, you can download it here for free. As seen in the above screenshots above, we will see the level of wear of our iPhone battery. On my iPhone 6S from March 2016, it has a wear of 14-18% according to my tests. In addition, it can tell you the maximum capacity it has measured in mAh (see the third capture) and how much activity you can have with that load according to the task (fourth capture). However, this app lacks the information about the charging cycles of the iPhone, for which we need a computer. Connect your iPhone to a Mac. Download and install CoconutBattery, a freeware program well known in macOS. Open it and go to the “iOS Device” tab. There you should see an image as the below capture. This app gives a much more complete information about your iPhone or iPad or Mac. At the bottom of CoconutBatter, we will see from top to bottom: current load, current maximum load, original capacity and load cycles. If you do not have a Mac, do not despair because all is not lost. There is an app that actually works for both systems. It’s called iBackupBot and you can download a 7-day trial version here. After installing is done, open the app with the iPhone or iPad connected, select the device and click on the “More Information” button that marks the red arrow. Once you click, a new window will open like this second capture, where you will see a lot of information about your device. Here you will find the number of battery charging cycles for your iPhone, as marked by the red arrow. Here, we see that the 400 cycles of my iPhone 6S match the figure that CoconutBattery gave us. With everything we’ve seen, you know everything you need about your iPhone’s health and charging cycles. This is how we can finally check our iPhone or iPad battery cycles. I hope this article will help you to know your iPhone battery health and the number of charge cycles used. By knowing about the device battery health will help us to take a step before it goes off. If you have any queries regarding any of the above method, let us know in the below comment section and we will get back to you as soon as possible to solve all your queries. Would you like to add any other important information to this story? Then write them to us through our contact us page. Did you check your iPhone or iPad battery health and charge cycles? 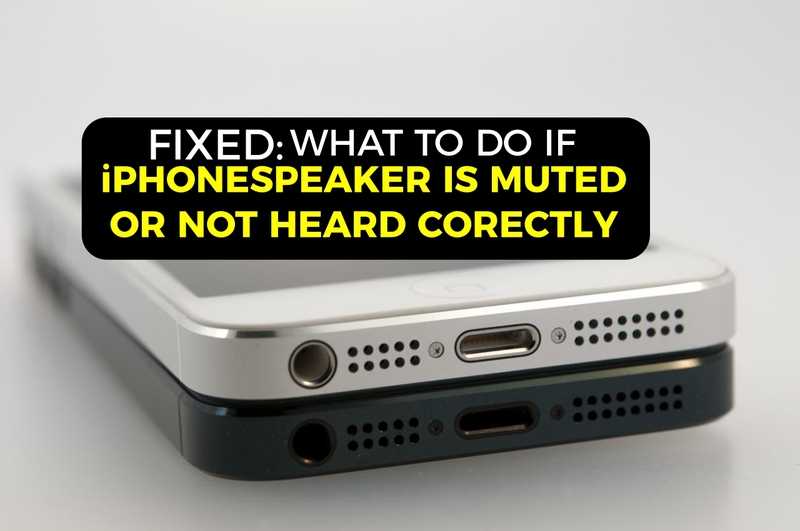 With the use and passage of time, some users come to notice that their iPhone speaker is not heard correctly or muted. The reason that is usually behind this problem is quite simple and it does not require an Apple technical service visit. Let’s see what the reason may be and how to solve the speaker hearing problems in iPhone. If you are searching for the reasons why your iPhone speaker is not working properly, then this is the right place for you to solve it. Let us see the problem and solution for iPhone speaker not working properly. Surely your iPhone has already a time. At least, enough so that dust and dirt have accumulated in different places. Mainly the audio connector (if it is an iPhone 6s, SE or previous) and the Lightning port. Dirt and dust cause false connections of headphones on the iPhone and blocks the speaker. That dirt at the beginning does not generate major problems in the day-to-day. However, when enough is accumulated it can generate drawbacks. Among them is making an involuntary connection in the headphone port that causes the iPhone to think that it has them connected. First of all, turn off your iPhone completely by pressing the corresponding button for a few seconds. Look for a wooden stick or metal clip. Insert it gently inside the audio connector of your iPhone and move it gently inside. In this way, dust and dirt accumulated there over time should be released. If you use a clip it will be easier to do the operation, but be careful not to scratch or squeeze too much so as not to damage the connectors that are inside. It is not advisable to use an ear swab as they may end up leaving other residues in the connector. Other options that may work is to insert the headphone jack into the audio jack several times, although this only pushes any obstacle in the background. In the end, you have to resort to cleaning this connector. Cleaning the iPhone ports every year or year and a half is a good way to keep problems away. As it is evident, this solution works on those iPhone with the independent audio connector. That’s something less to worry about on the iPhone 7 and up. Anyway, and since you’ve gotten to work, you can take advantage of cleaning the Lightning connector. Note: If your iPhone is old or new, make sure that the speaker is not covered with Screen guard or case. If at that it is covered, once remove and try hearing the voice from your speaker. It will work properly when you hear it directly from your ear without any medium like earphones or Bluetooth. As I said in this article, it‘s amazing how much dust and dirt can accumulate here. I just cleaned the jack on my iPhone 6S and I’m still surprised with the result. It is clear that if you keep your iPhone in a pocket of the pants, the accumulation is accelerated. This is how we can solve the earphones hearing problems on iPhone. I hope this article will help you to solve your iPhone speaker sound hearing problems. If you have any queries related to iPhone speaker, let us know them in the below comment section and we will get back to you as soon as possible to solve all your queries. Do you still have a problem with iPhone speaker? Then write them to us through our contact us page and we will get back to you with a solution. Did you ever face this problem with your iPhone speaker? If yes, what did you do to solve it?